With 2 distinct styles, Champion RotorChamp® Rotary Screw Compressors can meet any compressed air need. All RotorChamp® Air Compressors are designed for efficiency, ease of maintenance, and long life. 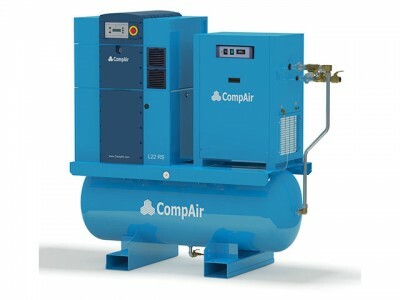 CompAir’s L Series lubricated fixed speed rotary screw products, offers a full range of high quality, energy efficiency compressors. Ranging from 10-330HP, CompAir’s L Series incorporates the latest design and manufacturing tools. Our fully enclosed packages deliver excellent noise performance and provide single point connections for both power and compressed air. The Hydrovane series rotary sliding vane compressors are reliable, versatile, powerful, and cost effective. They can be found throughout all sectors of industry, including automotive, food and beverage, energy and manufacturing (engineering, woodworking and processing industries) to name but a few, with specialist solutions within transit, gas and snow. In fact they are the perfect business solution to meet your requirements for reliable, high quality compressed air or gas. The low noise levels of the Hydrovane compressor means that they can be installed right alongside your equipment. Models are available in either an open format or fitted with enclosure panels that further reduce noise levels.